Fountain of Barenton in Broceliande. We did not see any white-footed stags ferrying souls to the eternal shores, meet any mad washerwomen, ogres or medieval maidens in white dresses. Apparitions were thin on the ground. No black knights challenged us to mortal combat. But there were plenty of messages for Merlin. And none for David Beckham. Guy Richie’s new film, Arthur – Legend of the Sword, in which Beckham has a cameo role, was filmed on location in Snowdonia, the Forest of Dean and the Isle of Skye. King Arthur is said to be buried in Glastonbury or Worthyvale in Cornwall. His sword ‘Excalibur’ is meant to be in a bog on Bodmin moor. Camelot has been variously located in Tintagel, Winchester and Roxburgh in Scotland. Broceliande – a legendary forest in Brittany, France. Merlin’s grave is in Brittany, an hour from L’Orient airport. “I don’t think this is his final resting place. He’s a spirit. He is everywhere. Not in one place,” said Marie, a professional Merlinologist and official tourist guide for Le Centre de l’Imaginaire Arthurien, which aims to discover and spread Arthurian knowledge. The centre has five official ‘Round Table’ guides. In Broceliande forest, 40 miles southwest of Rennes in northern France, there is a pile of red slate blocks. Through them grows an ancient holly tree. In its branches are flowers and wreaths of seven times knotted hair. Wedged into the peeling bark are little anonymous messages. Some are written on slips of paper, some on the back of supermarket receipts. All are addressed to Merlin, the ancient intercessor between man and nature. The world’s most famous wizard still has many fans. Standing near a Neolithic gallery grave, the tomb is indisputably an ancient site of worship. The woods contain cromlechs and burial mounds from the Bronze and Iron ages. At Barenton, there is a pool where Merlin reputedly inducted Vivian into necromancy. Deeper into the forest the Pont Dom Jean is believed to be the bridge of the sword crossed by Lancelot to deliver Guinevere. There is also a ‘Rock des Faux Amants’. The lover who betrayed Morgan, Arthur’s half-sister, who was turned into stone. 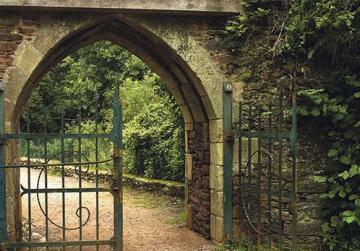 Old medieval gate in Broceliande, Rennes. 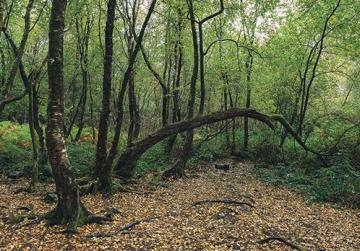 Broceliande is a part of Paimpont forest. The misty lakes and bubbling ponds of Les Forges and Perray and the castles of Trecesson and Pas-du-Houx are straight out of the pages of literary romance. 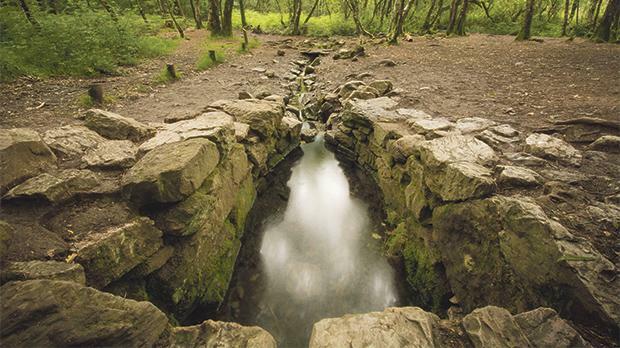 The forest contains what many believe is the fountain of Barenton, where Merlin sat on his perron and conjured up a storm. In 1990, the woods burned for five days. 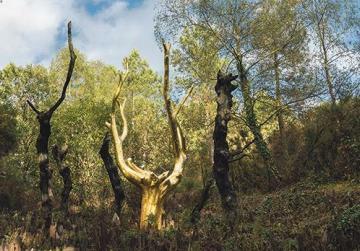 As part of a massive re-plantation scheme, artist François Davin created his ‘L’Arbre d’Or’, a chestnut tree covered with gold leaf and surrounded by five blackened trees. Our walking tour led us to the Val Sans Retour (The Valley of No Return). Surrounded by rocks which – to the guide’s eyes – resemble the backbone of a sleeping dragon, we looked into the Miroir-aux-Fees (faerie pool) and sat on Merlin’s seat, a rock formation where he reputedly watched sunsets thinking up new ways of enchanting the world. The Golden Tree at the entrance of the Val Sans Retour (Valley of No Return), erected to commemorate the great fire that ravaged the forest in 1990. All the Arthurian tours of Broceliande finish at Comper Castle, former stronghold of the king of Brittany. Here, Merlin is reputed to have created a crystal palace for the faerie Vivian so that none could gaze upon her. Guy Ritchie’s film has been released worldwide on May 19. For further information about guided tours of the area, contact Centre de l’Imaginaire Arthurien, Comper-en-Broceliande Castle, 56800 Ploermel (tel: 97 22 79 96/Fax: 99 08 53 05).